From this point forward, Lain is drawn into the virtual-reality world of the Wired, a futuristic version of the present-day Internet. As she discovers more about her true identity, numerous existential issues are raised: who is Lain? Why does she seem to have such enormous power in the Wired? Are bodies necessary if we can exist without flesh? How is it that human beings even exist? And, who is God? Out of all the “post-Evangelion” anime to be released, Serial Experiments Lain is surely the most successful television series. It manages to surpass Neon Genesis Evangelion in its intellectual coherence and thematic development, and succeeds in conveying very similar messages about the necessity of physical human contact. The haphazard, raw brilliance of Hideaki Anno’s Evangelion has its peculiar charms, but this cool, crafted series by Ryutaro Nakamura succeeds on a different level. Anno is a master of bringing naked psychological exposure to a visual medium and startled an anime fanbase accustomed to stock characters, cliche plots, and commercial exploitation. Evangelion’s visual storytelling innovations and emotional intensity were rightly considered a necessary shock to the system, and Lain most likely would never have been created had Evangelion not been a huge success. Many imitators of the show followed in its wake, and indeed, most of the “artsy” and avant-garde directing techniques here are borrowed from Anno’s visual vocabulary –periodic flashing of text, bizarre still shots on inanimate objects, interior monologues, and Eisensteinian montage. But the ends to which Nakamura brings these techniques in Lain deserve a close look from a philosophical and theological standpoint, which cannot be said for the ultimately irrelevant Christian/Jewish symbolism of Evangelion. Anno’s work is almost wholly psychological; Nakamura’s work, by contrast, is not only psychological but genuinely intellectual and by its conclusion, nearly spiritual. The animation quality is high, though minimalistic in the vein of Evangelion’s latter half, filled with still-pans and little background motion. The soundtrack, too, is minimal, cued similarly to the films of Stanley Kubrick, David Lynch, and The X-Files; indeed, the conspiratorial noir atmosphere is very remniscent of the best of that TV program. For this viewing, I watched the English dub, which is above average, though it lurches occasionally into melodrama when the scene demands emotional restraint. Of course what stands out are the Evangelion-inspired directorial techniques, but this time they feel more purposeful in conveying the blurry lines between the real and Wired world. Little in this show seems spontaneous or random, a sense that was confirmed in this viewing (this is the second time I have watched the series). It lacks Evangelion’s emotional intensity and abject sense of existential despair, and is not character-oriented as such. That may not be a weakness, however, as the primary focus of this show is upon the ideas. It is a marvelous idea-oriented program, one of the few examples of television that actually challenges the mind rather than dulling it. It rightly won a Japanese Ministry of Culture prize for excellence, and will undoubtedly be regarded as a modern classic of intellectual exploration. This is certainly an anime series that discussion alone will not exhaust. There are many interesting philosophical and spiritual ideas floating about, but the dominant theme is that of immaterial versus material existence. Or, in other words, human life without and with a body. If, as the Wired “God” and his followers claim, human beings are more advanced in their evolution when they shed their body-shells, why shouldn’t we all just join together as one in the Wired? Why don’t we all form a large collective unconscious, an Emersonian Oversoul, residing in Nirvana? The idea is extremely similar to the Human Instrumentality Project of Evangelion, where the secret committee plotted to join all human beings together by dissolving their bodies into soup and thus ensure that no individual soul would ever be alone again. Historically, it certainly resembles the tenets of Buddhism in which material existence is an illusion, as well as Platonic Gnosticism, where the flesh is seen as wholly corrupt and salvation found by living a purely spiritual experience. Standing against this view in Lain is that bodies, human memories, the stuff of daily existence, are essential to who we are as human beings. At the center of this struggle is Lain, the girl created by Tachibana Labs in order to bridge the gap between the Wired and the physical (“real”) world. She was created to fight Masami Eiri, the self-proclaimed “God of the Wired” who wanted to join all human beings into disembodied souls in the Wired. As a result, she has existence both in the “real” world and in the Wired world, though she was first created in the Wired by her “father.” Her search for identity and for the essence of human existence fuels the show’s plot, and by the show’s conclusion, Eiri’s solution to isolation and human loneliness has been decisively rejected. This is a show that ultimately celebrates and affirms the need for such things as heartbeats, touch, flesh, and physical connection. In that sense it is quite compatible with the Christian view of humanity, contra the Gnostic view: it affirms that flesh is fundamentally not a bothersome shell to be shed, as so many cultists East and West have long claimed. We are both flesh and spirit. Even the Bible says that we will have resurrected bodies; we will not simply be souls flitting about like ghosts in heaven or hell. It is ultimately Lain who overcomes the false God and who ensures that the real world cannot spill over into the Wired, and vice versa, thus guaranteeing the safety of physical human existence. She is only able to do it be ceasing to exist in the memories of every human being around the world. In some sense, she is a Messianic figure in the show. There are even a false Lain (anti-Lain?) in the Wired, created by the false God’s followers the Knights, used to mislead people into being sucked into the Wired permanently. At first Lain is confused about this other version of her, but she comes to realize who she is and, through the love of her friend Alice, becomes sure of “the one truth” in the world: that love, memory, and the true God are what sustain human existence. There are two significant subtexts in this show as well; one deals with post-modern social isolation, and the other deals with the effects of technology on human nature. I found the first subplot to be the most compelling, the emotional “hook” of this story. Lain is a girl who in the real world is normally ignored. There is a strong temptation for someone like her to become absorbed into the online world of the Wired and become a Somebody there, wholly absorbed. Indeed, those who commit suicide in order to give up their bodies are usually social outcasts or otherwise outsiders. As Lain comes to realize that she hardly matters to her “parents,” or “sister,” or most of her classmates, she begins to succumb to the lie that Eiri is her creator and that the only way to free herself is to get rid of her human body. It is only the love of a wonderful friend, Alice, who helps her realize that being alive is real. 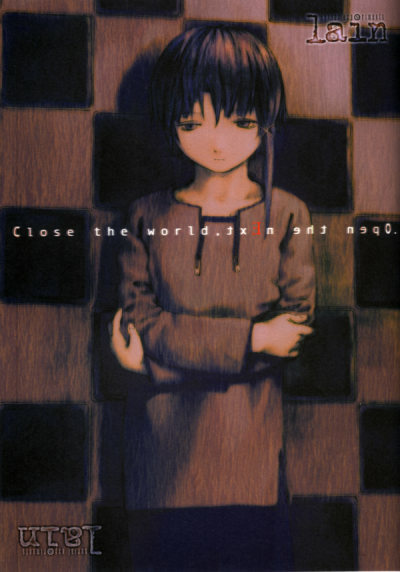 The most affecting scene of the series takes place when Lain, almost wholly taken in by false God Eiri, is slipping away from human existence. Alice puts Lain’s hand over her heart, and her hand over Lain’s heart. Together they recite, “Heartbeat–thump. Thump. Thump. Thump.” A more effective presentation of the value of life is hard to imagine. There is another temptation that Lain faces besides the shedding of her physical form. As a powerful software program in the Wired, Lain is able to manipulate and even erase the memories of others–memories of herself. When the anti-Lain causes havoc and hurt to many people, including Alice, and Lain fails to persuade anyone that she and the anti-Lain are not one and the same, she decides that the only way to undo the hurt is to erase everyone’s memory. One of the more interesting postulates in the show is that human beings only exist when they are remembered by others. So by erasing herself from the Wired and from people’s memory, she is ceasing to exist, and thus undoing all the damage and hurt caused by the false Lain and the false God that was using her. This saves humanity, but then, where is Lain? Does she really exist? The final episode details how the world might be if she had never lived, and all seems well; the boundary between the real and Wired world is clear. And yet. And yet . . . . Lain is still aware of herself. Why? Why does she still continue to “exist” when she does not in fact exist in the real world any longer? The final temptation is for her to regard herself as a Goddess, to become a watcher in the Wired looking over the real world, but with no substance. But Lain still does not understand why she continues to exist . . . .
Then, a heavenly vision appears in the sky. It is an image of her father, the one who pretended to be her biological father but in fact is her true creator. He remembers her. He helps her realize, too, that memories can never be completely erased–in the world where she does exist, her father and Alice feel something strangely missing that they can’t quite place. As a result, she can still continue to have existence in a human body and as a spirit on the Wired. The theological implications of this are clear. Human beings exist not only in the memories of others. Even if everyone were to forget them, they can still exist because they are remembered by their Creator. Lain thus overturns one of the cornerstones of modern philosophy, Descartes’ cogito ergo sum. Descartes was only sure of his existence by the fact that he was self-aware. Lain proposes that instead, our existence is only sure because we are remembered not just by others, but ultimately by our creator, our Heavenly Father. Our self-awareness is insufficient. Only because we are held in the true God’s awareness can we exist. This is explicated quite literally at the show’s end. Lain isn’t a Christian show in any proper sense of the word, but it is actually much moreso than the symbol-drenched Neon Genesis Evangelion. While it does indulge in ideas drawn from Carl Jung about the collective human unconscious, the fundamental view of existence and humanity it promotes is compatible with the Christian affirmation of the physical creation, and even smuggles in an alternative ontology that is ultimately can be interpreted as theocentric. Quite an accomplishment for any anime series, certainly, but in the scant world of good TV entertainment this certainly qualifies as some of the most profound thinking about human nature to date. Michael is on hiatus for the remainder of August. The Vault series resurrects entries from his personal blog about anime, written from 2002-2006. Entries will appear in the series every other day. Previous PostA potential bad ending to Claymore?Next PostPotemayo – a cool dad most Japanese boy would kill to have and gay cheerleaders on parade. An excellent review! You’ve actually made me think more deeply on what the series was trying to say (I’ve always considered it a sci-fi show alongside the Ghost in the Shell franchise, with a bit of philosophy thrown in) but the spiritual themes throws a whole new light on it for me. Lain has always been one of my favourite series too, possibly the one that woke me up to the idea that anime can be profound as well as stylish and fun to watch. Even moreso than Eva, your comparisons with which were pretty interesting. Thanks for sharing…I really need to re-watch this show now! Thanks, Martin. This is my favorite out of all my old articles, which is why I posted it first. I was a bit more pretentious back then–hence the use of a lot of Big Words :)–but this is one of the few old articles where I still think I can stand proudly behind the main philosophical and theological ideas I expressed. And I still think the show holds up under this kind of analysis. Others–Evangelion among them–have not proven so enduring to me on that level. Anyways I’m glad my review opened up some of the show’s spiritual possibilities. It definitely might also shed light on the agenda behind Haibane Renmei as well. I hope you enjoy the rest of the Vault articles that are coming over the next several days! Thanks. I remember this Anime, Lain. The first time I saw Lain was years ago, and sort of reminded me of a cross between the Twilight Zone, where is the grandmother dies and her five to six year old grandson somehow contacts her via his toy telephone. And the movie the Matrix. The only thing that was very sad for me was how it ended. I did a double take and had to watch the last ep.one last time till the whole thing clicked with me of the who, what, where, how, and why. I have to admit the story starts off very slow, but for a reason, so anyone new to Lain, and watching for the first time, the story is sort of complex, but has a message towards the end. What an interesting view of Lain. “We continue to exist because we are observed by the Creator” is basically Bishop Berkeley’s response to the solipsism that Descartes led him into. However, I think Lain was a bit more haphazard than your analysis implies. A lot of the series consisted of speculations of what the emerging communications technologies might mean, and they were an amalgam of Whole Earth Software Catalog fever-dreams: from John Lilly to Ted Nelson to Vannevar Bush and MEMEX. Plus excursions into Chiaki Konaka’s fascination with UFOs (there’s a reason NieA_7‘s Chiaki is a UFO-nut). The early days of computer networking had this millennial aspect (I don’t know of any great references, though John Markoff’s What the Dormouse said hints at it, as well as Ted Nelson’s Computer Lib/Dream Machines). The early episodes of Lain seem to capture a lot of the feeling of that era, right down to having her program her Navi in LISP. On the other hand, I suppose those early episodes can be seen as necessary preparation for a theme along the lines of the one you describe. I loved your interpretation. However, I do not believe there are Christian-based beliefs implemented on the series. It is not through a “creator” believeing in the human soul that it exists, but it is more directed towards the implications that our identities are formed as they are percieved by others. We are subject to exist when others recognize our existence. If we consider Oriental philosophy regarding resurrection and the fact that we are born without any memory of our past lives, then we may be able to understand this: When we are confronted with an event that reacts upon our actions/events in past lives, we perceive a strange sensation, perhaps like the one that Alice and Lain’s father had; a feeling of “something missing” or “theres something wrong here”. If we were to base ourselves in a Heavely Father figure for this analysis, then where could we position Alice? It is the vibration of souls that share deep connections, that which keeps these souls alive as they recognize each others’ existence. This actually goes well as a counter arguement (what Shinji and Lain both upheld) against the principle of Universal Unity, the convergence of souls, and the goal towards a state of Primordial Soup or convergence of all souls into Energy (The Wired), as seen in both series. I agree with dm on his post. The series has more of a technological agenda with its philosophical focus on new technologies and the questioning of reality, as well as the embrasing of new concepts of reality. The series, as I percieve, is a clash of conceptions (new and old) of reality in a technological Era. I really enjoyed watching Lain. I had to watch it twice because the the first time i did not really understand it. …even the second time all of it did not really sink in . And that is why i post this , to thank all of you that wrote comments. i just stumbled upon this thread while i was doing my daily search of anime pics on google, some thing i do often and lain happens to be one of my favorite things to search. i really love lain and was suprised that it got souch a great review, because every time i show it to someone. they watch the first 3 or 4 eppisodes and put it down forevery (which really hurts my feelings because land is one of my favorite animes of all time.) and another reason that this suprises me is that i have never heard of this anime anywhere. of all the people i’ve asked about it , and trust me i ask a lot of people being in the NAVY and always traveling, no one has even heard of it. i thank all of you for finaly being people who can understand lain like i do. you are all honorable people in my book. Oh, I did. Actually I also wrote A LOT about it. … in french. I know. Sorry. But if you do read french this could REALLY interest you. Lain is my all-time favorite anime and I gave it a lot of thought. Your review is real good btw and helped me apprehend some things I did not get by myself. Cheers for that. Great article on Lain! I want to chat with you more over Skype, if you have time. But since you’re busy, I’ll write a comment her a bit. Yeah, I don’t think girls I used to fall in love with remember me at all, even though I remember each one of them in details, failing to be my crush’s good old memory, failing to exist in them. Yes, once reputation crumbled, it’s hard to recover, just like the files corrupted with virus, the whole files need to be deleted. The only way to escape is completely disappearing from social network sites, or the Wired. I thought I had to erase my want for flesh. Or mentality of hito-hada-ga-koishii. 人肌が恋しい。Gnosticism, but rather Cathars’ idea of vegetarianism had me for a while. Ultimately erase 3-D body and move in to 2-D spiritual realm. “Heartbeat–thump. Thump. Thump. Thump.” Ahh, how much I want this! Yes, skinship. Skinship is the reaffirmation of flesh! I truly need skinship. Me Tangere!